Slow cooking beef helps to develop intense flavour and keeps the meat tender and succulent. It usually involves cooking your chosen cut of beef in a slow cooker or casserole dish over a low heat for a long period of time, with the meat submerged in liquid. Tough cuts of meat are ideal for slow cooking as the lengthy cooking process helps to tenderise them. The most suitable cuts of beef are the muscles that have worked hard during the cow’s life, as these are tougher cuts and have lots of connective tissue. Cuts that have a lot of fat running through them add moisture and flavour to the dish. Marbling between the muscles, not the surface fat, indicates a good cut for slow cooking. Cuts of beef used for slow cooking include beef cheek, short rib, feather blade and oxtail. Browning the meat prior to slow cooking caramelises the meat and adds flavour. In addition, marinating the meat prior to slow cooking will help bring out the flavour of the beef even more. Here we give a recipe for a beef casserole in which the meat is cut into cubes. If you would prefer to cook your meat as a whole piece follow the instructions as below but bear in mind you will need to increase the cooking time. Season the beef with salt and pepper, dust with flour and fry in a little oil until caramelised all over. You can play around with the flavours when slow cooking beef – why not try substituting some of the stock for red wine or port. Paul Heathcote uses beer in his recipe for Braised beef with bitter beer, green peppercorns and mushroom pie while Shaun Hill adds tomato paste to his Beef stew with mash and leeks. Slow-cooked beef is traditionally served in winter with mash or in a pie. 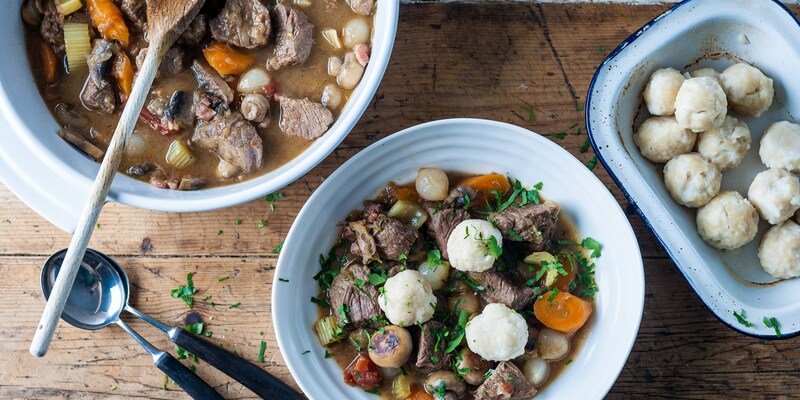 Dominic Chapman serves his with dumplings or for something more continental, try Geoffrey Smeddle’s Beef braised in red wine with Provençal vegetables.